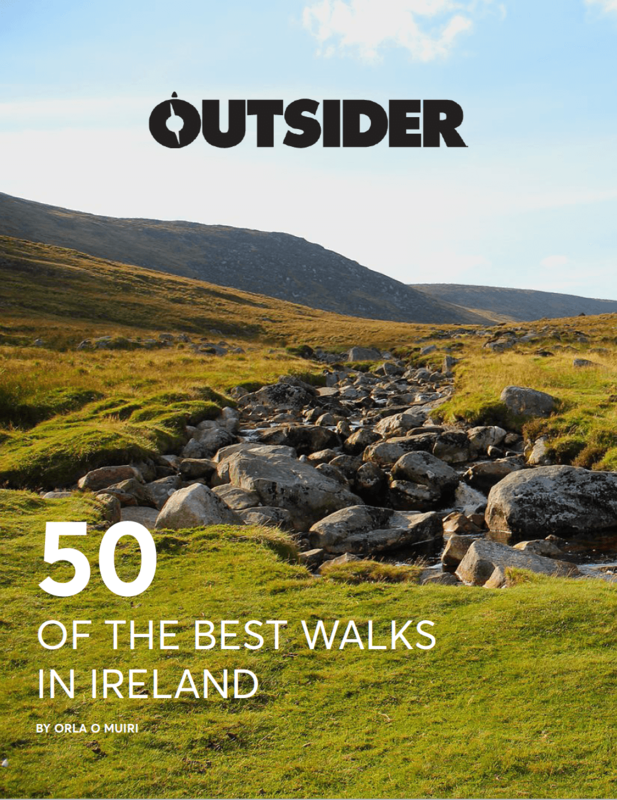 A headtorch or headlamp is an essential bit of kit for any outdoor lover. Whether you are a trail runner, hiker, mountain biker or camping enthusiast, you will always find a use for a good headtorch. However, choosing the right one to suit your needs can often be a bit of a minefield. It is important to look at weight, durability, brightness, ease of use, cost, comfort and stability when choosing your headtorch. And of course, it is important to choose a headtorch that suits its end use. A trail runner might make a very different choice to a person who is looking to use a headtorch for casual camping trips, for example. Brightness (or luminous flux) is the total quantity of light emitted from a source of light. It is expressed in lumens (lm) and is measured in the laboratory with a sphere. The higher the lamp’s maximum lumen value, the more light it emits, e.g. 900 lumens is brighter than 400 lumens. The lumen value given by manufacturers is typically the maximum power output of that lamp, regardless of the length of time it actually produces this figure. This is the length of time your headlamp will produce usable light. For years, manufacturers have been free to decide how to record and measure burn times as there is no international standard. Several years ago, Petzl decided to define where they felt light output stopped being usable, as there were some crazy burn times being thrown around! Its baseline equated to the light given by a full moon, so once light output is lower than this they stop recording, even though the torch is still giving out some light. Brightness and burn time are two inextricably linked parameters of any headlamp. 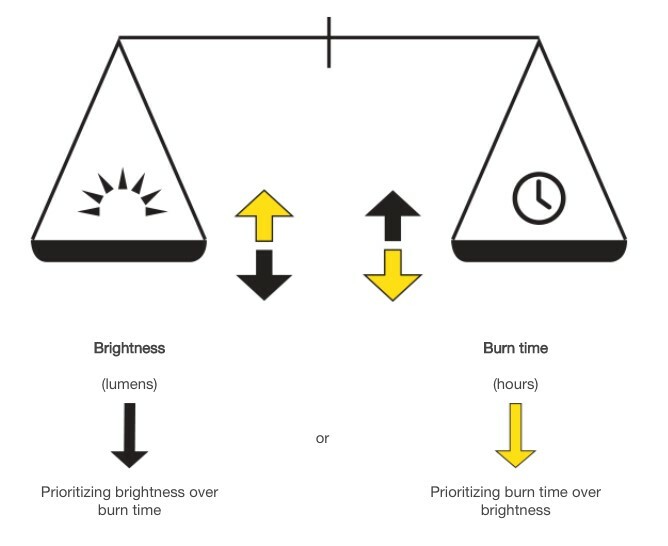 For a given quantity of energy, increasing the brightness automatically decreases burn time, and vice versa. Most quality manufacturers will now indicate the lumen output and associated burn time for that output. 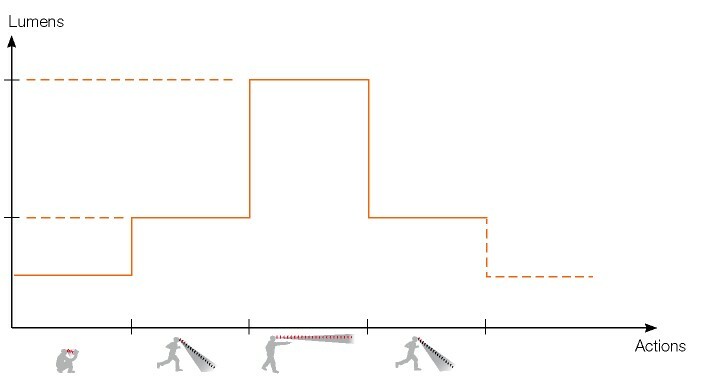 The distance the beam will reach depends on the brightness of the torch and its beam pattern. 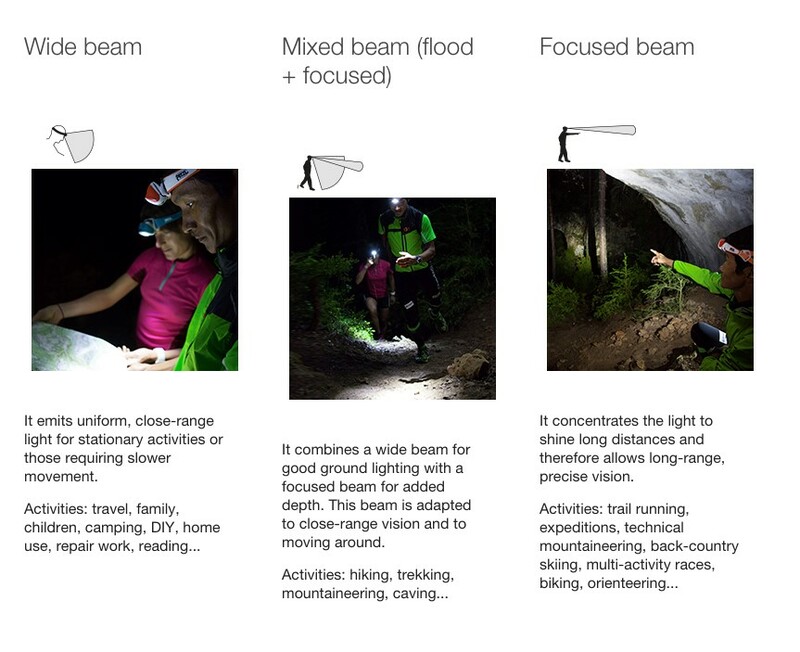 Petzl headlamps feature different beam patterns, in order to best suit the diverse needs of its users. These range from a flood beam for proximity vision and camping/general use, to a focused beam to see at a distance or probe a specific location. Beam distances are usually listed on the packaging and can range from just a few metres up to a few hundred metres. Several headlamps allow you to swivel the head of the torch to point straight ahead or down at the ground so you can further customise where your light is shining. This exclusive technology, developed by Petzl and available on its Performance headlamps, uses a sensor to analyse reflected light, instantly delivering optimal brightness and beam pattern for the given situation. Reactive lighting also has the benefit of optimising battery life, offering greater burn time for your lamp with the same battery. The Reactive lamps are designed especially for intensive sports. There is no need to manually switch between modes; the user’s hands are completely free, allowing complete focus on the activity. The battery used in your headlamp has a big impact on performance. A battery with a higher output will be able to maintain higher lumens for a longer time. For example, Petzl’s 750 lumen NAO+ features a 3100mAh battery for sustained use while Petzl’s CORE battery has an output of 1250mAh, weighs less than a larger battery and is more than sufficient for use in the lower powered headlamps. Disposable vs Rechargeable Batteries for your Headtorch? If you can’t quite decide between the rechargeable or disposable option, then Petzl’s Hybrid technology is a great option. Petzl’s new compact headlamps run off both the CORE rechargeable battery or three AAA/LR03 batteries, without an adapter. This is a practical and flexible solution that allows the user to take advantage of each of these energy sources, depending on use. Compatible with all TIKKINA, TIKKA, ZIPKA, ACTIK, ACTIK CORE, TACTIKKA, TACTIKKA + and TACTIKKA +RGB headlamps. When it comes to weight, it really comes down to personal choice. The heavier torches, such as the Petzl NAO+ (185g), will often feature a battery pack on the back of the head strap. For some, this offers a better distribution of weight in addition to the benefits of a very bright light. When it comes to those that are planning to use the headtorch on the move, fit and comfort are really important. Make sure the headlamp has suitable adjustments to cater for wearing hats and helmets and also try the headtorch on to see how the band feels around your head. There are a number of features that don’t come as standard on a headtorch that are well worth looking out for. It is a good idea to play around with the headtorch to see how easy it is to use. Are the buttons easy to switch on and off and can you easily change between the various settings, e.g. low/medium/high/flashing/red? Can you operate the headtorch with gloves on? This is better for night vision, making it an ideal choice for those who are navigating after dark. This is a handy feature for road runners and those running in groups. It’s also pretty handy if you happen to use your headtorch on your bike commute too. If you are looking to use your torch on the move, an additional strap across the top of your headtorch can provide a bit of extra stability. 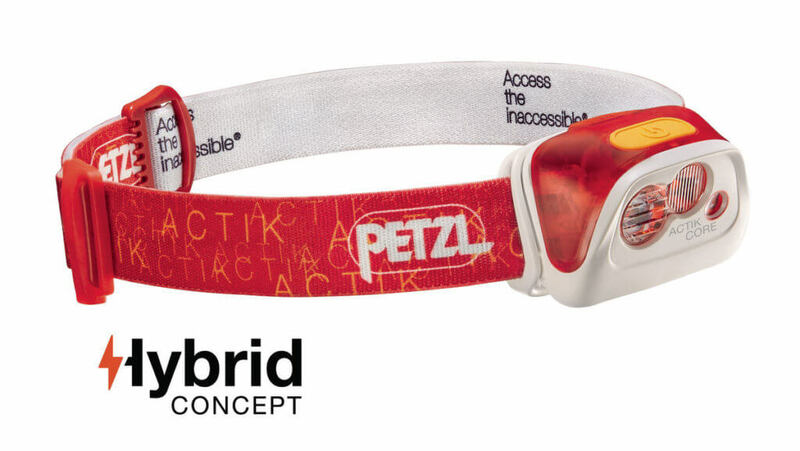 Petzl headlamps have been in constant evolution for more than 30 years. New technologies have allowed Petzl to invent and design headlamps that are ever more powerful, more lightweight, and more adapted to the needs of outdoor enthusiasts. To ensure excellent performance and quality for each product, all Petzl headlamps undergo different mechanical, electrical and optical simulations during their development. These tests adhere to rigorous protocol, with requirements that significantly surpass those imposed by the common standards. Beyond laboratory tests, the first prototypes undergo numerous field tests, allowing true-condition verification of the ergonomics, the comfort of use, and the reliability of the headlamp over time. The product will receive final approval only after many months of development and testing. Petzl does tests regarding lamp water-tightness, the mechanical strength of lamps (drop tests, impact and crushing), the mechanical durability of moving parts, vibration tests and finally the individual inspection of each lamp, in terms of manufacturing quality as well as lighting performance. Visit the Petzl website to find out more.